Veeam Availability Suite v8 has been released and customers and partners are already upgrading their environments and exploring the several new features that have been added to this latest version of the software. There are many enhancements that are not part of the marketing activities, but nonetheless they all contribute to create every time an awesome version of the software. I’ve created a list of my favorite 8 new technical features, my “gems”. In this series of posts, I will show you them and dive a little bit into their technical details. In this seventh episode, we will talk about Save As Default. During these series of posts, I talked about some incredible features we added in Veeam Availability Suite v8. The fact they were not used as part of our marketing efforts do not mean they were small additions to the new version of the software: things like tag support or Snapshot Hunter cannot be really considered minor features or small improvements. There are, however, also many small improvements that are contributing to make Veeam a better and better product for everyone. And sometimes, these improvements are just a new button in the right place. Default settings in Veeam Backup & Replication are configured to offer, out of the box, a great experience to our users. Most of our customers simply use the default settings because they are fine with them, and they suit well their needs. But we also know that any environment has its own characteristics, and most of all requirements, also in terms of data protection. Previously, if you wanted to configure a parameter of a Job with a non-default option, you should have done it for every new job you were creating. As the number of jobs increased, additional time was needed to change those parameters, but most of all you would have risked some inconsistency if you forgot at some point to change one of the desired parameter. With Save As Default, you can now configure every single parameter you will find in the “Advanced Settings” of the Storage option of a Job, set it like you prefer, and before closing the Advanced view, simply save this set of changed parameters as your new default. 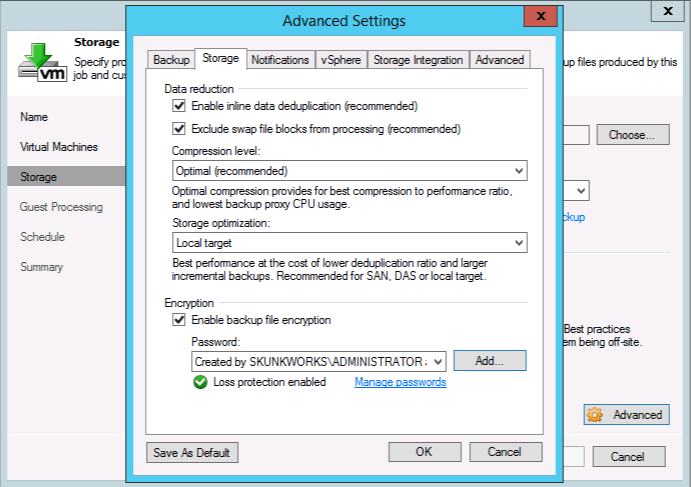 Say for example you want all your backups to be encrypted: encryption is not enabled by default, so once you have configured encryption for a job, the button “Save As Default” will be enabled, meaning at least one setting has been changed in comparison with the existing default settings. If you click on the button, the new configuration will become the new Default, and every new job you will create will have for example encryption enabled. As I said, every parameter in the Advanced Settings can be changed and saved: the backup mode for example, because you still prefer to use the Reversed Incremental instead of the new and default Forward Forever-Incremental. But you can also set compression level, storage optimization, encryption, notifications, and storage integration as well; say you have one of the supported storage arrays, you do not have to enable the use of storage snapshots in any new job any more. This is, in my opinion, the perfect example of what a hidden gem is: a small feature, most of the times surfacing into the interface as a simple button, but really powerful and simple to use. Many customers have already written us to say thanks for this: it’s one of those small enhancements that can make the work of many people easier.